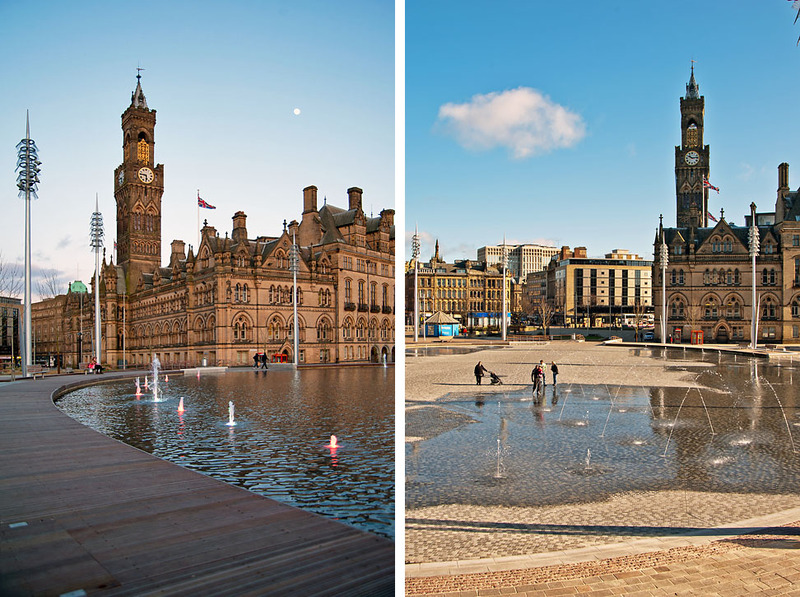 Alsop’s work with the Bradford Centre Regeneration team created an opportunity to design multiple high-quality open spaces to optimise Bradford’s existing heritage, landscape and architecture. The team approached the planning of Bradford from the perspective of having multiple centres of interest, rather than a single centre. The team identified the many communities which comprise Bradford and give it its quality of difference. A grid of 64 x 1km squares was laid over the city in plans, and in each was found the kernel of an experience, event or activity. Suitably promoted, these squares constitute a ‘new tourist map’ for Bradford, providing somewhere to meet; something to see, do, sell or buy. Emphatically each will contain a feature that people outside the neighbourhood might want to visit, and that people inside the neighbourhood can be proud of. Phase I, Bradford City Park, was completed in 2013. The area in front of the Town Hall has become a vast public space that can be water-filled by fountains to create a ‘paddling’ pool or drained to provide a performance space.